What do you look at when you have a child who is not performing in class? Is there something more the child should be doing? Is there something more we as teachers or parents could do? Are we addressing this child’s individual learning style? Is the classroom’s environment conducive to their needs? There are many aspects that can be looked at, yet we could be missing a crucial part of the picture. If this child is stuck in ‘survival mode’, none of these external factors are going to have the impact we would like. 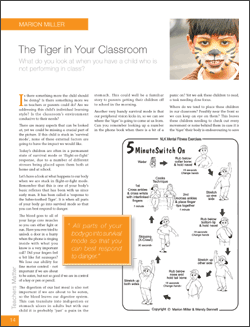 Today’s children are often in a permanent state of survival mode or ‘flight-or-fight’ response, due to a number of different stresses being placed upon them both at home and at school. Let’s have a look at what happens to our body when we are stuck in flight-or-fight mode. Remember that this is one of your body’s basic reflexes that has been with us since early man. It has been called a ‘response to the Sabre-toothed Tiger’. It is when all parts of your body go into survival mode so that you can best respond to danger. The blood goes to all of your large core muscles so you can either fight or run. Have you ever tried to unlock a door in a hurry when the phone is ringing inside with what you know is a very important call? Did your fingers feel a bit like fat sausages? We lose our ability for fine motor control – not important if we are about to be eaten, but not so good if we are in control of a key or pen or pencil.